An Appleton business takes a stand against what they call mistreatment of property. APPLETON, Wis. — An Appleton business is banning some unsupervised youths over what they call mistreatment of property. 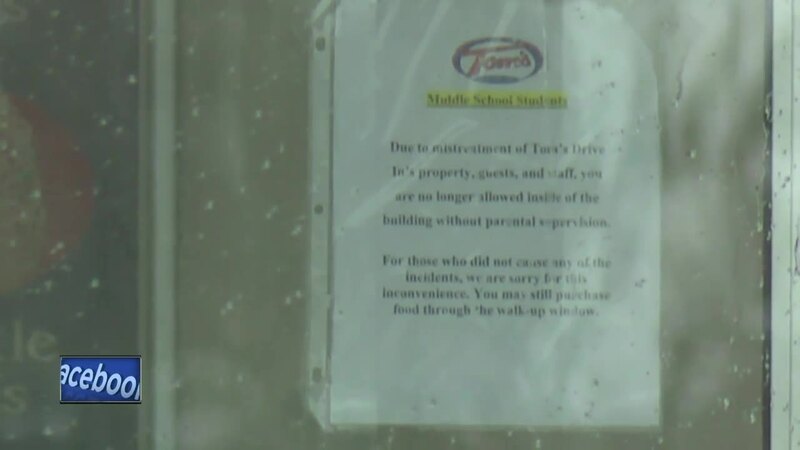 A sign on the door of Tom's Drive-In on East Wisconsin Avenue is addressed to middle school students. "Due to mistreatment of Tom's Drive-In's property, guests and staff, you are no longer allowed inside of the building without parental supervision. For those who did not cause any of the incidents, we are sorry for this inconvenience. You may still purchase food through the walk-up window." NBC26 went to Tom's Drive-In on Thursday and spoke with the sister of two workers who says she supports the business's decision, even though some call it unfair. “I think that it's within his rights to say they need their parents with them it's sad because I think middle school kids should have the right to go in and have fun but if they're going to act inappropriately then there's consequence," said Tianna Beebe. The manager spoke out on Facebook, saying they had to keep middle school students out after, "Many wasted attempts and talking with the kids to refrain from damaging the booths, making messes and yelling profanities”. He said he welcomes any questions or concerns.